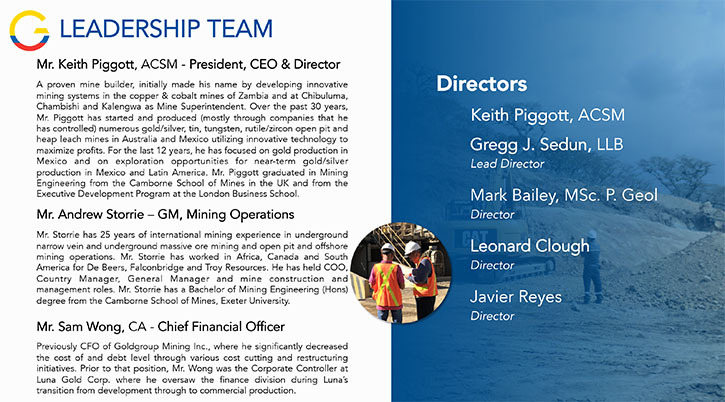 Core Gold Inc. (TSXV: CGLD, OTCQX: CGLDF) is a Canadian based mining company involved in mining, exploration and development of mineral properties in Ecuador. 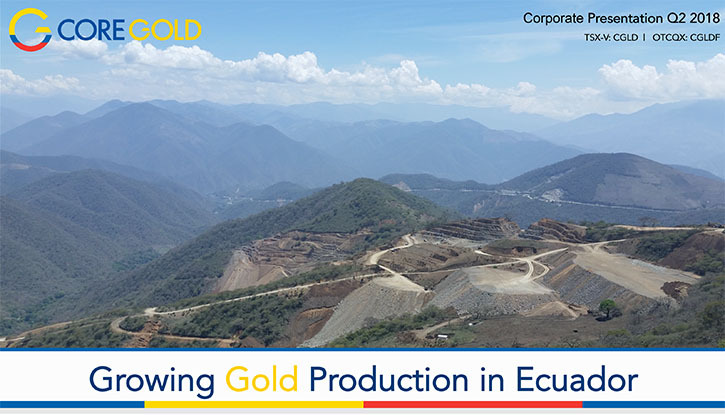 Core Gold is currently focused on gold production at its wholly-owned Dynasty Goldfield project, located in Loja Province in southwestern Ecuador, and on continued development at its Zaruma mine, located in the Zaruma-Portovelo Mining District of southern Ecuador. 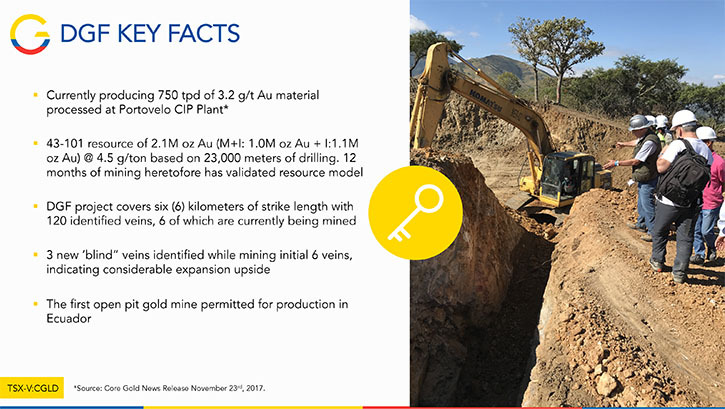 We learned from Keith Piggott, CEO of Core Gold, that the Dynasty Goldfield open-pit mine is currently producing 1,800 ounces a month and by the end of this year will ramp up to 4,000 a month making a nice cash flow. The company also owns the Portovelo mineral plant, located close to the Zaruma mine operations. 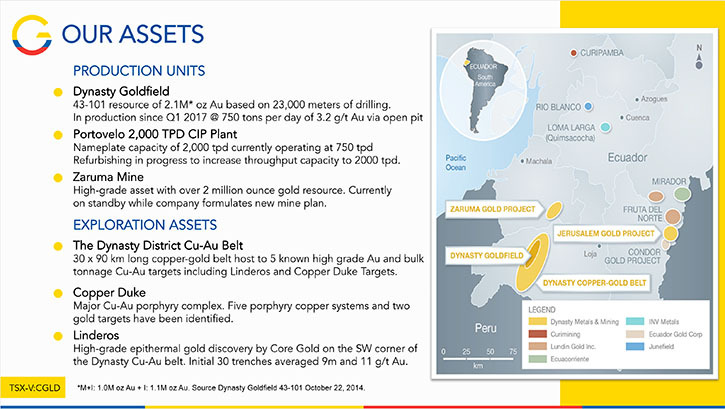 The most exciting part of the company, according to Mr. Piggott, is its significant gold exploration projects, including the Linderos and Copper Duke area in southern Ecuador, all of which are on the main Peruvian Andean gold-copper belt, extending into Ecuador. Al Alper:	This is Dr. Allen Alper, Editor-in-Chief of Metals News, interviewing Keith Piggott, CEO of Core Gold. Could you give our readers/investors an overview of your company, your focus and current activities? 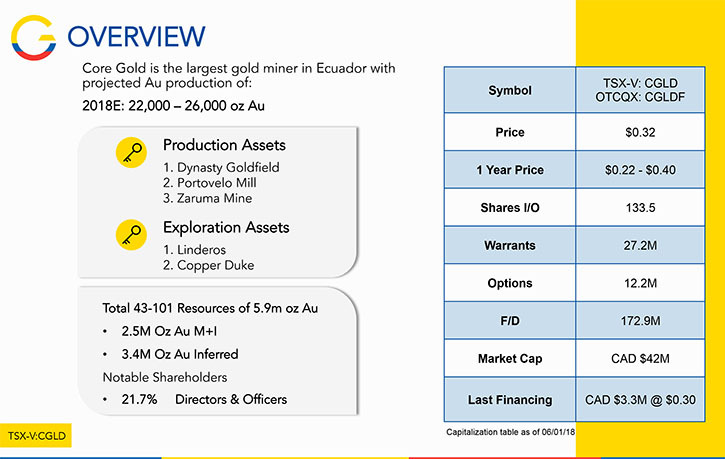 Keith Piggott:	Core Gold is a company that owns considerable assets in Ecuador, solely in Ecuador. We are doing considerable exploration. We have one producing mine, the Dynasty Goldfield mine, currently producing 1,800 ounces per month, and we'll ramp up by the end of this year to four thousand ounces a month. It's an open cut mine, with a grade in excess of two grams per ton and it's feeding our own treatment plants at approximately 750 tons a day. We have a number of veins operating. The most exciting part of our company is not the fact that we're growing production dramatically and making a nice cash flow. The most exciting part of our company is our exploration. Our exploration areas are on the main Andean trend, coming up from Peru into Ecuador, and basically are on the hinge of the Andean trend that comes into Ecuador, where there are tremendous, giant earth scratches, of gigantic proportions. Farther south, you have Yanacocha on the same trend, which is Newmont, 45 million ounces, and farther south in the same trend, Pierina, 10 million ounces of gold. Pure gold that is! Now the interesting thing about them is that they're all underlaid by copper golds as well. We have exciting exploration potential in several of these areas, where we hold in excess of 50 thousand acres of land. Al Alper:	That sounds exciting. You're in a great area, with a great opportunity for increasing your already large resource that you have right now. Could you tell us more about your plans for 2018? Keith Piggott:	Absolutely. In 2018, we're expanding production. We're taking the treatment plant up from 750 tons a day to more than double that capacity. We're doing this out of cash flow. The second and the most exciting thing is we're drilling two exciting exploration projects that we have, the Linderos property and the Copper-Duke property. In Linderos we have five holes planned to go in the next few weeks. We'll also be drilling Copper-Duke, since we have the permits now. They're deeper holes planned at Copper Duke so we've elected to go to the shallower holes on the Linderos property first, where if you look at our website, you'll see a gold bearing zone, which is more than one kilometer long and around a 100 meters wide. At Linderos, there is a massive shear down on the side of the porphyry. The surface sampling we have done so far shows incredibly high grades over quite wide widths. Now for example we have widths of ten meters, greater than ten grams on the surface in hard rock trenches. We also have an area along the same zone for 32 meters, with around 3.2 grams. All of these are very interesting results. In the lower-grade center zone of the extension of the brecciated shear, within the center zone of the porphyry, it is going .5 to .7 and it’s leachable as well. Basically we have a zone, which we intend to use. It's over a 100 meters wide, one kilometer, a thousand meters long at the moment. It is open on the one end and obviously open at depth. We need to put some holes into it and get some idea of how these surface grades relate to grades of the fifty-two hundred meters, below the surface and then start to build up an ore resource. So that's an extremely exciting situation. Al Alper:	That sounds excellent. It really sounds like a great opportunity. Could you tell our readers/investors a bit about the massive turnaround story? Keith Piggott:	That is exactly the word, a massive turnaround story. 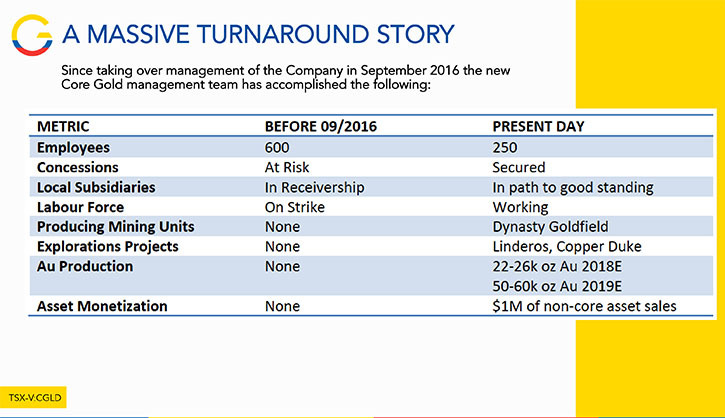 When we took this company over on September 9th, 2016, it was a company with 25 to 30 million dollars of debt. It had no operations at all going and it had 600 employees that had been on strike for seven months and hadn't been paid, a really difficult situation. We raised a small amount of money, nowhere near enough money I might add, but we came to Ecuador because we believe that Ecuador really is the place to be. We started cleaning all this up and we started the open cut mine at Dynasty Goldfield. We refurbished the plant, which had been working at 200 tons a day. We got it to work at 750 tons a day and of course we are now expanding it to more than double that. The assets were here but they were just basically badly managed, badly utilized and they had created a lot of debt. They'd been mining an underground mine in Zaruma probably the wrong way. That mine is a very large underground mine, and I think it has some potential for the future but for now we focused on Dynasty Goldfield. Why? Because we started mining open cut, which is much easier to get. We are now mining the ore bodies at the Dynasty gold field, which was drilled prior to us taking over. We had 200 relatively shallow drill holes into that gold field, which is over eight kilometers long, about 3 kilometers wide and currently has in excess of a hundred veins shown. By drilling the surface material, the results indicated a clear resource of 2.2 million ounces. Since we've started mining, we are showing that resources is more than correct. It's not a reserve, it's a resource only. Since we're mining from the surface down, there're no old workings at all. These are virgin gold fields. We are getting the results that we would expect to get. Now we're currently mining a grade that is between three and three and a half grams. There are areas in there, where we have discovered new veins. The veins vary in width between three meters up to in excess of 10 meters. They would average about four to five meters wide. So they are a good mining width for a mid-size machine in an open cut. They're oxidized so they're easy to mine, they're easy to treat, and there's not much blasting taking place. We're very happy with the way that we've developed our operation. We've reduced the debt from between 25 and 30 million dollars down to around 11 million dollars at the moment. We've achieved that inside the 18 months since we've been here. I think we have a world class region. We have more money in the kitty. We've developed our operations better and built up a higher cash flow. We've also brought top-quality people in from around the world. We have basically a United Nations team of top management. They are all people in which I have great confidence, people I've known in the past and I've used my world-wide experience to bring them here to Ecuador. They've come because this is an incredibly exciting opportunity. Al Alper:	Fantastic. That's excellent. Could you tell our readers/investors a bit more about yourself, your team and your Directors? Keith Piggott:	This is a team of well-seasoned people. I have extensive experience. I'm Anglo by birth, Australian by nationality, but I've worked in Africa, Australia, New Guinea, Mexico, all over South America in various exploration digs and I worked a long time in Mexico. Now we've decided that Ecuador is the place to be. We have a British mining engineer, who is now the CEO of production. We have a Brazilian manager of our plants, he has vast experience in many operations in Brazil, especially in maintenance. We have a Mexican group planning engineer. We've brought in an Argentinian geologist to run the mine because we are the largest operating gold mine in Ecuador right now and the first in terms of open cuts. And Ecuador is just starting. The reason we are in Ecuador is because this country has been almost untouched in terms of exploration and there's literally no large scale mining going on. Lukas Lundin came in here with Fruta del Norte and they're building it and should be in production by the end of 2019. There is a Chinese group EcuaCorriente. They're building, but nobody is actually in production. We are in the forefront of this in Ecuador, plus we have this massive exploration potential because the country hasn't been explored even though it's between Peru, which has been reasonably explored and Colombia, which has been reasonably explored, on the Andean trend and it is on the hinge of the Andes, right on the southern end. That's why we're finding our ideas were correct beginning with the Linderos discovery in middle of last year. We are just starting to drill it, but our surface exploration is nothing short of stupendous. That was a virgin discovery, no old workings, nothing nearby, and there was no indication of gold there. Nobody had actually found the gold sitting at surface. Al Alper:	Sounds like an excellent area and an excellent time to be exploring. Could you tell me about the share structure and Board? Keith Piggott:	At the moment we have approximately 133 million shares out. Fully diluted with shares and warrants we’d be at 172 million shares. I'm the CEO. My other Directors are Mark Bailey, who was the original guy that put Minefinders together. He came along with the company, a really good man. We have Greg Sedun, he was with Robert Friedland when they did the Diamond discoveries in the 90s and he's been associated with some very interesting groups since then. He's also been with me on and off in a number of ventures. He's Canadian. I have Javier Reyes, my Mexican banking friend, whose been investing with me, for probably the last eight or nine years. We came to know each other very well in Mexico. We also have Leonard Clough, Canadian, who resides in Vancouver. It's a five man board, pretty small, very articulate, very intelligent group of people. I really like them. They've been very supportive especially when we didn't have any money. We are in the process of raising a loan from an investor bank, that's my Mexican friend's connections, of 15 million dollars. We expect to put that money in our bank sometime in the next three to four months. What we will do with that money is pay down some of the debt, expand the plant and capitalize the drilling. The focus of this company is drilling out these ore bodies. Al Alper:	That sounds excellent. What are the primary reasons our high-net-worth readers/investors should consider investing in Core Gold? Keith Piggott:	The reason to invest in Core Gold is because we currently have a market cap of around 40 million Canadian dollars. We're producing a free cash flow of between five to six hundred thousand dollars a month and we'll be expanding that to probably a free cash flow by the end of the year, per month, of around one and a half million dollars. If you start to add that up, it doesn't make any sense to have a market capital of 40 million dollars. Nor does it make any sense when you consider the next year would be expanding to double again. So in other words, from a production stand point alone, the company is radically under-valued. We expect to be a hundred thousand ounce a year producing company within two years. Now we started off with nothing last year, we immediately got to 1,800 ounces, and we hit the capacity of the plant. The mine will produce the gold, we don't have a problem with the mine. It's just a question of refurbishing the back end of the plant. The front end of the plant is perfectly okay, the back end of the plant needs to be built up. 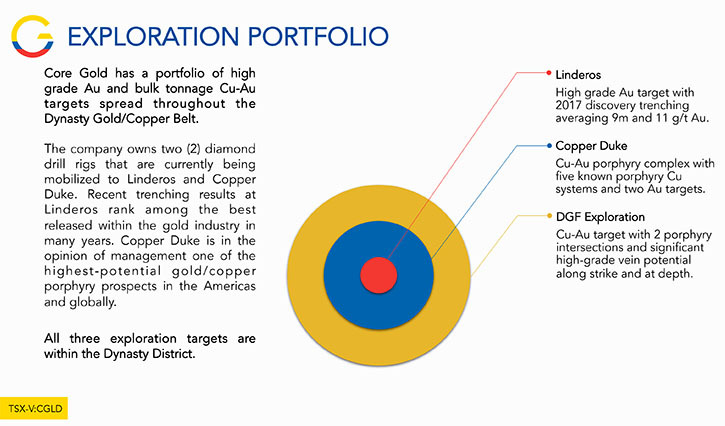 The main reason you should invest in Core Gold is because we have these three main exploration areas, which basically are a district play. This is what the majors want by the way. We have 2.2 million ounces at Dynasty Goldfield in just one area and already in production. The other two areas have done major surface exploration, but no drilling. And we are about to start drilling. This company is at take-off point. 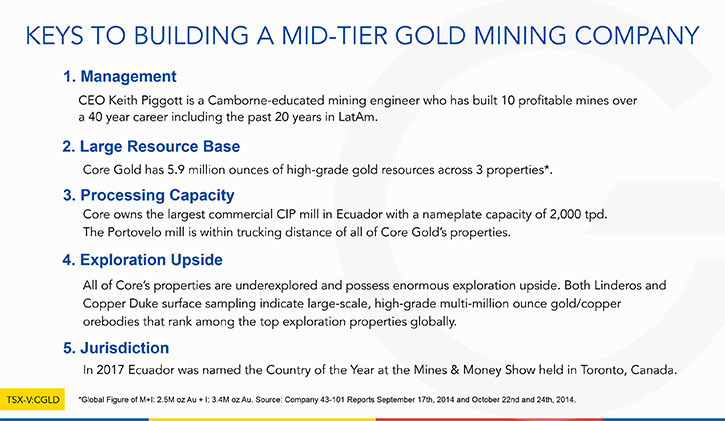 The other reason to be in Core Gold is because it's in Ecuador. Ecuador is an under-developed country. It needs mining and it's gone pro-mining. The new President, Lenin Moreno, has encouraged free enterprise individuals to become ministers. A majority of these ministers, including the minister of mining and ore and development come from private industry. So they are people who believe in private investment. 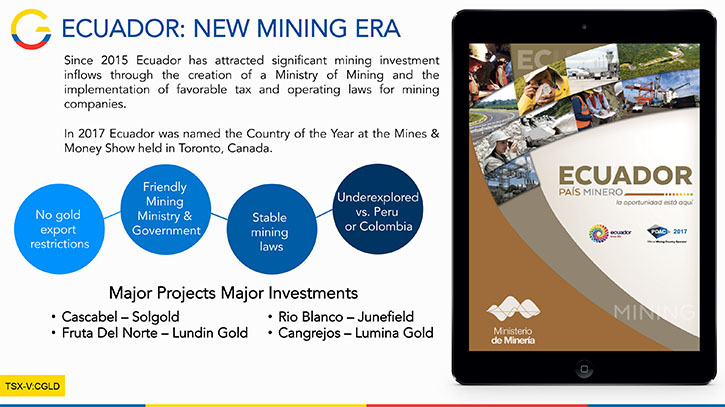 Of course, we're in the forefront of mining in Ecuador. The government's backing us to be the leading miner in the country, at least in the near term, at least until these big mines kick in. We, by that stage, should become fairly large as well with a number of mid-size operations. So I think we have the potential to raise our share price dramatically over the next year, two years, three years. And that's why I think that people should take a hard look at what we are doing. Al Alper:	That sounds like an interesting opportunity for our high-net-worth readers/investors to consider investing in Core Gold.